Created and developed by world-renowned psychic and intuitive healer, Vianna Stibal, ThetaHealing® , originally called The Orian Technique, evolved from Vianna’s discovery that she could heal people’s physical ailments by going up to God or Creator and asking that a healing be done. She would then witness the healing take place almost instantly in some cases. Having been diagnosed with lymphatic cancer in her right femur she was told by several specialists that she would either have to have her leg amputated or she would die. She decided to work on herself. Using the method that she had successfully used on others she was able to not only stop the cancer from spreading but have her leg heal completely and even grow back to its original length. 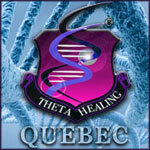 She has since used ThetaHealing® to heal tens of thousands of people. Personally trained and certified by Vianna Stibal as a Master ThetaHealing® practitioner and teacher, Martin Neufeld has received the highest certification in ThetaHealing® the Certificate of Science. He is the only Master ThetaHealer in Eastern Canada and Quebec and the only Master instructor qualified to teach ThetaHealing in French in Canada. Martin is founder of ThetaHealing® Quebec whos mission is to promote and teach ThetaHealing® in French to Quebecers and Canadians alike. Give yourself the gift of positive lasting change and healing today! Experience a ThetaHealing® Course to learn life altering techniques that will help you create a balanced, abundant and fulfilling life. Follow the menu links above for information on certification courses and consultations.